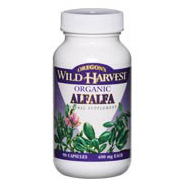 Alfalfa is a nutritious food that naturally contains minerals, vitamins and chlorophyll. Recently, it has been shown to contain phytoestrogens, specifically the isoflavones genistein and daidzein. Certified organic alfalfa tops encapsulated in Sodium Lauryl Sulfate-Free Capsules. As an herbal supplement, take one capsule three times daily, or as directed by your health care professional. Alfalfa Tops - is shipped in a discrete, unmarked package. Orders are processed immediately and usually take about 3 to 5 working days to be received. We do ask that you try for 2 to 3 weeks to feel the full effects. Any information received is used only for order processing and shipping purposes. Your information, such as e-mail address, will never be disclosed to a third party.